It's not unusual for a model to have two different dials. Lot of models offered more than one dial... even from the earliest days of Hamilton's wrist watch line. But it is unusual to have one style dial offered in one year, and a completely different dial the next. Then, in 1960 it received an entirely different dial with a white-colored chapter ring. If it wasn't for the shape of the lugs and the unique bracelet design, you would not suspect they were the same model. 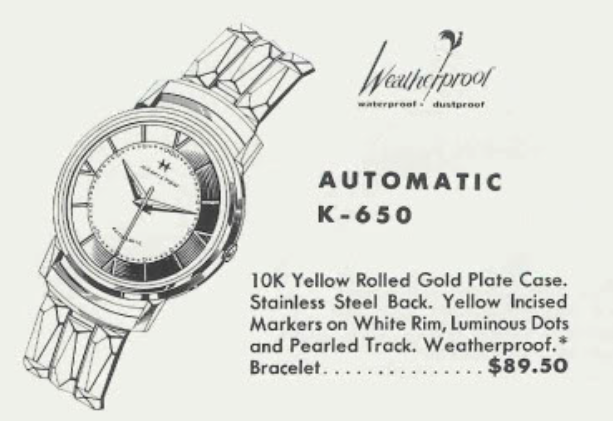 The Automatic K-650 came in a 10K rolled gold plated case with a stainless steel back. It's the only Automatic K-series watch to come in a 10K RGP case. Regardless of the style dial installed, tucked within the watch is a 17 jewel Hamilton 661 automatic movement. 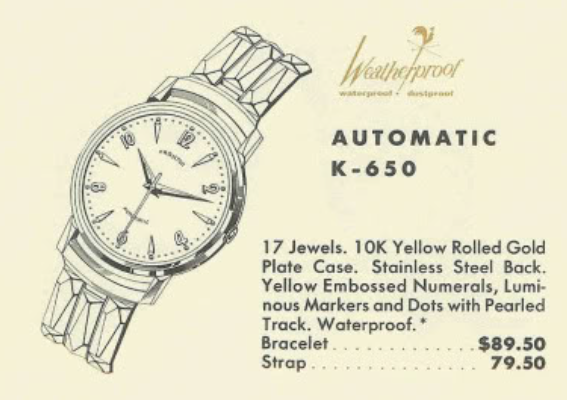 I recently purchased a K-650 project watch and it came on a Speidel expansion bracelet with a calendar wheel window from 1968... that was kind of interesting but not enough so to keep on the watch. The crystal on my project watch was rather beat up so just changing that out will be a nice improvement. Although the watch runs, based on the appearance of the movement, I'd say it's been a while since this watch had a trip to the spa. The 661 has a couple of tricky reassembly steps. The first is to get the train bridge back on - it's large and the escape wheel, 3rd wheel and 4th wheel all have to be perfectly lined up in order for the bridge to drop in place. The other tricky step is to reinstall the rotor carrier - as you need to get four pivots to line up for that. In the shot below, everything is cleaned and ready to be put back together. The movement is running again so it's off to the timer to see how it's performing. Not too bad at all... just a little tweaking brings the beat rate up to 5 seconds fast per day. Now to put the dial and hands back on and put it back in the case. The last part to go back on is the oscillating weight. It's very floppy and awkward when it's installed so putting it on last is a good way to make sure you don't fat finger the movement and drop it. And here's the finished project in it's pillow shot. A new crystal and fresh strap give the watch a step-change improvement in appearance. A complete overhaul also means this watch will run as great as it looks. I happened upon a K-650 with the white rim dial from 1960. Initially I thought it might just be a donor movement for another project someday. Obviously the crystal was shot, the crown was shot and the dial had some obvious corrosion - which was pretty telling since the crystal was hard to see through. I decided since the case was fairly good, it was worth giving an overhaul a go. It turned out pretty good I think. The dial isn't the prettiest dial I've ever seen but it's not horrible either. I shortened the stem a smidgen after taking this photo - as I noticed the crown was little proud of the side. Not a bad looking watch, considering what I started with! Always interesting to see a watch that I've bid on looking way better after some of your TLC. Even a blind squirrel finds an acorn every now and then. I tend to lose more than I win so I got lucky on this one, I guess.